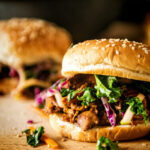 Toss a few simple ingredients int he slow cooker, chop the salad and chow down on this killer Slow Cooker Hoisin Sliders with Sriracha Kale Slaw for your next big game day party. Whisk the sesame oil, ginger, garlic, honey, and hoisin sauce in a small bowl. Arrange chicken in a slow cooker and season with salt and pepper. Pour the hoisin mixture over top. Cover and cook on low for 4 to 5 hours. When done, shred the chicken in the sauce and toss to combine. Meanwhile, make the slaw. Combine the chopped cabbage, kale, carrot, and apple in a large bowl and toss to combine. Season with salt. Whisk the honey, sriracha, vinegar, and pepper together in a small bowl. Drizzle over the kale and toss. Toss the slaw again before serving to assure that everything is mixed well. Serve the shredded chicken along side the slaw with slider buns for guests to create their own sliders.